Amazon has updated its current eBook file format to a new one called KF8 which is a HTML5-based file format. What this means is a whole host of new features and options for publishers who want to give their eBooks a little something extra. For us that means much richer content in the form of eBooks, and with the hundreds of customisation options it has the opportunity to transform how we read graphic novels and comics on eReaders. Initially it'll only be available for the Kindle Fire, however they are planning on rolling it out across the entire Kindle line. It's also entirely compatible with the PC/Mac and iPad/iPhone versions of the Kindle app. While it still doesn't include video or audio it is certainly a step forward and will no doubt keep the Kindle range and the Kindle store right up there with the top dogs of eReaders. 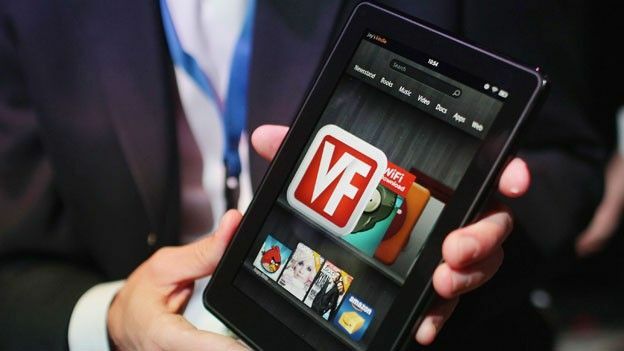 With a 7-inch Gorilla-glass coated screen the Kindle Fire boasts a simple design and a simple purpose; to be the tablet that offers the best in entertainment. It also has 8GB storage inside and Kindle Silk, the innovative web-browser for Kindle Fire which uses the cloud to speed up web-browsing times.